A preview of tonight's Toronto/Washington game. 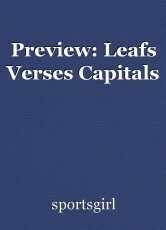 The Toronto Maple Leafs are probably going to have the advantage tonight, going up against the Washington Capitals. Capital's head coach, Barry Trotz confirmed that Braden Holtby is going to start in net tonight. Holtby's been really struggling this season. Also, Leaf's goalie, Frederik Andersen is 3-0-1, has a 2.00 goals against average, a .932 save percentage, and two shut outs when facing Washington. Toronto, however, has lost two straight games. In order for the Leafs to win tonight, the team have to contain Capital's captain, Alex Ovechkin. He has 71 points this season.